Are you looking to give a new cover to your smartphone? And tired of using the same types of back panels, flip covers, etc. Then this post is for you... 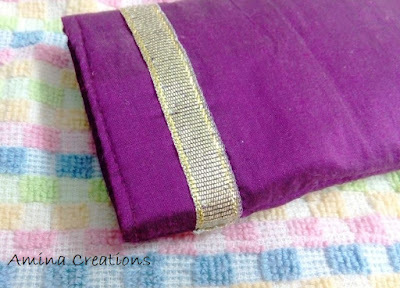 Here I am going to share a simple method of stitching a fabric smartphone cover. The main benefit of making your own phone cover is that you get the choice of selecting your favourite fabrics, colours, patterns, and also bringing out your creativity. Here I have used silk cotton fabric, but you can also use cotton, satin or silk fabrics. Make sure that when you are using thin fabrics, you need to use cotton lining to add grip to the fabric. I have used a stiffener to make the cover strong and hold its shape. Using plastic stiffener is best as it will also keep the phone from getting wet if water accidentally spills over the fabric phone cover. Here I have shared a basic design where I have added a lace. You can customize it according to your style and wishes using sequins, beads, fabric paints, etc. 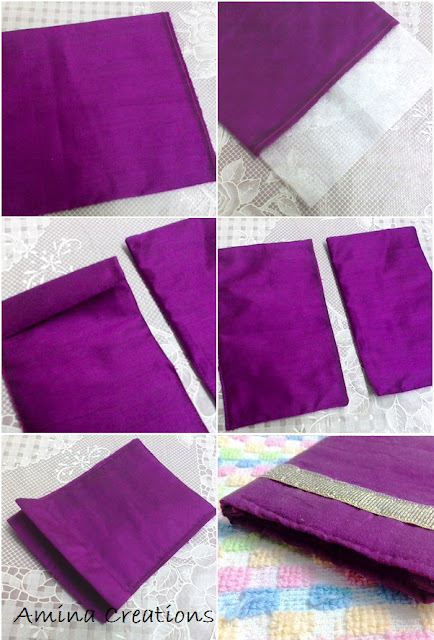 Cut two pieces of cloth with measurements 6”x 10” (customize it according to the size of your smartphone). Turn it to the correct side, measure the length and breadth. Take length 1/8" less than actual measurement and use the measurement to cut the stiffener. Now fold 1/8” of cloth along the open side inwards and stitch on top as close to the edge as possible. Do the same thing with the other piece of cloth as well. Now you will have 2 finished pieces of cloth with a stiffener sandwiched between two layers of cloth in each piece. Add the lace as shown on both the sides. Now stitch the two pieces together leaving 1/8" allowance along the 3 sides leaving an opening on top to insert the phone. Decorate with beads, paints or sequins and show off your creative side. Your smartphone cover is now ready.